The school of St Michael the Archangel was founded in 2003 on the intiative of a group of families belonging to the Schoenstatt Family Federation. They firmly believed in the transforming power of education. The school is a new project in the framework of Schoenstatt‘s pedagogy and spirituality which took root in Santiago and other cities and towns more than fifty years ago. The school adds a new class each year, so that our first school leaving class in 2016 will be composed of students from the founder generation. 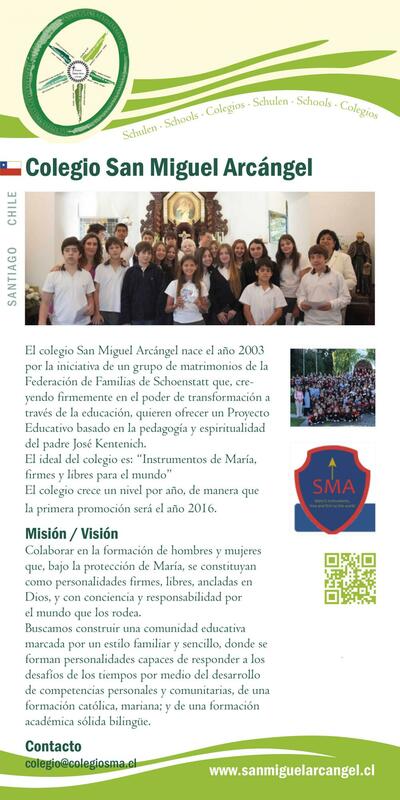 The College of St Michael the Archangel meets the need to educate young people who are able to cope with the challenges of today and tomorrow in the Las Condes community.